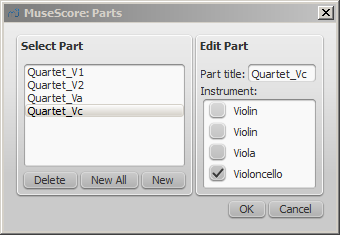 Note: In the current version of MuseScore, it is not possible to split a single staff (that contains two or more voices) into separate parts. So, any instrument that you want to print out a separate part for also needs to have its own staff in the full score. 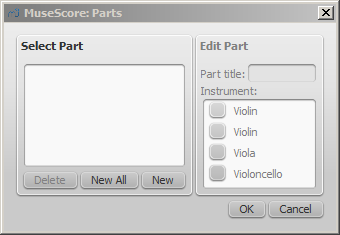 You can define the parts at any point after creating a new score. 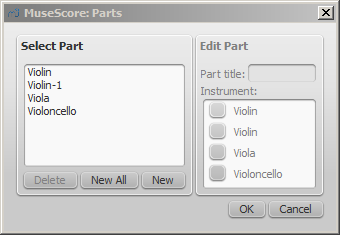 You only need to define the parts once for each score, but you can make changes if needed. 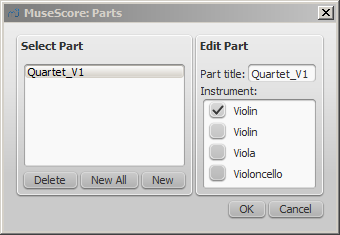 The following instructions use a string quartet as an example, but the same principles apply for any other ensemble. 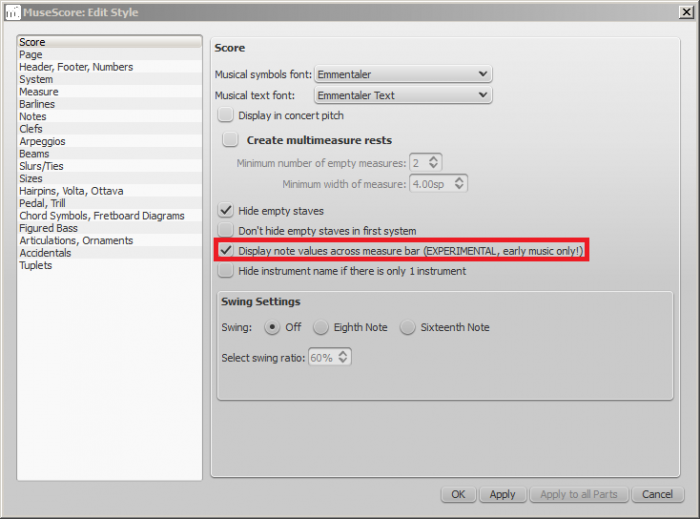 Initially, the programs renders the MIDI to notation using certain default settings. 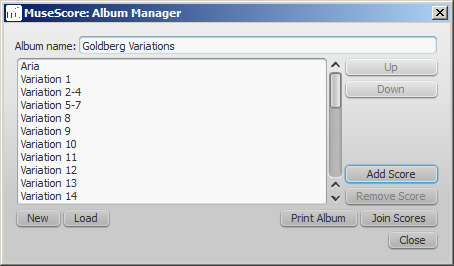 A MIDI Import Panel appears at the bottom of the screen, showing a list of tracks (only tracks with note events are shown) and the operations available for each track. 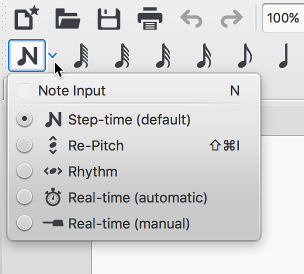 You can change these settings on a track-by-track basis and then reimport the data: The “Apply” button (at the top) submits any changes with immediate effect. 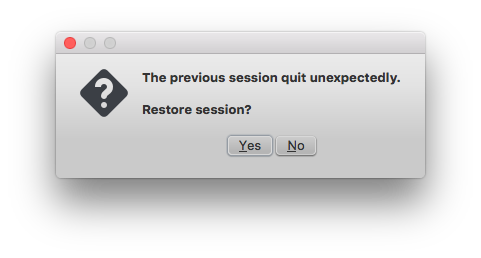 The "Cancel" button immediately cancels any unsaved changes. The final result should be a better quality score reproduction of the file. 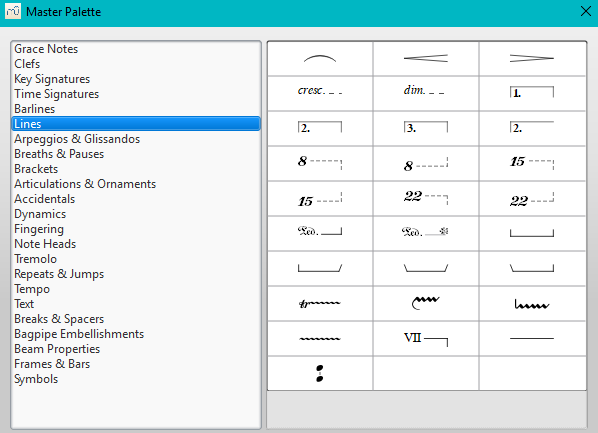 As of MuseScore 2.0.3, a range of common fretboard (or chord) diagrams for the guitar are provided in the Fretboard Diagrams palette in the Advanced Workspace (previous versions featured only one diagram). A chord diagram can be created for any fretted, stringed instrument by customizing an existing one. It can be saved to a custom palette for future use if required. 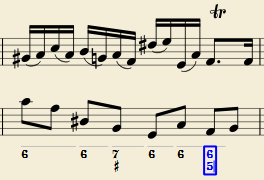 MuseScore tukee monia tiedostomuotoja, joiden avulla voit jakaa ja julkaista partituureja muodossa, joka parhaiten vastaa tarpeitasi. 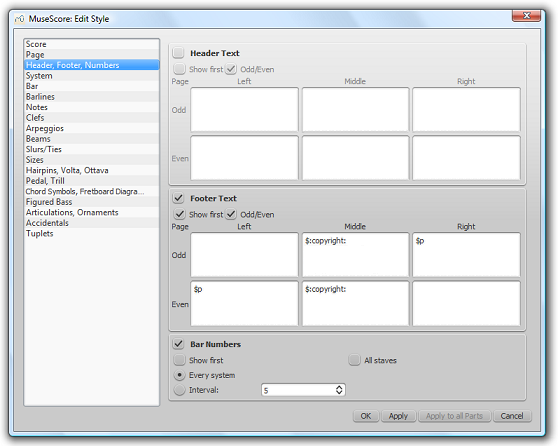 Edit "File name" as appropriate, and select the desired file format in "Save as type." For more details, see Save/Export/Print. For more details, see Share scores online. 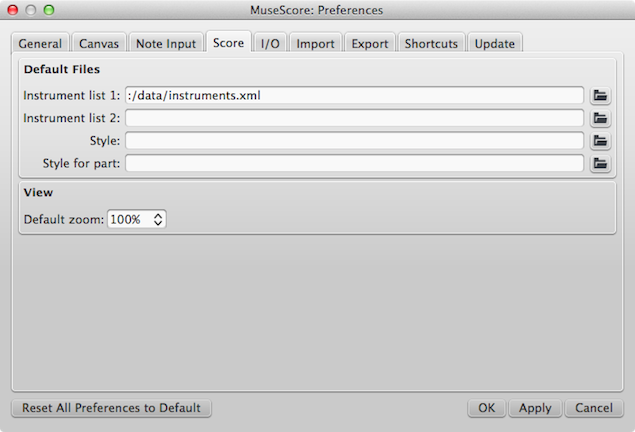 MSCX is the uncompressed version of the MuseScore file format. A score saved in this format will retain all information, except images. It is recommended for when manually editing the file format (using a text editor). PDF (Portable Document Format) files are ideal for sharing your sheet music with others who do not need to edit the content. This is a very widely-used format and most users will have a PDF viewer of some kind on their computer. SVG (Scalable Vector Graphics) files can be opened by most web browsers (except Internet Explorer before version 9) and most vector graphics software. 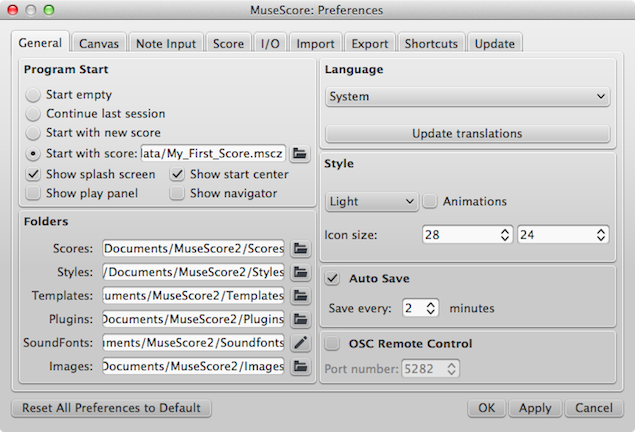 However, most SVG software does not support embedded fonts, so the appropriate MuseScore fonts must be installed to view these files correctly. To set resolution and transparency of exported SVG files, see the instructions under PNG (above). WAV (Waveform Audio Format) is an uncompressed sound format. This was developed by Microsoft and IBM, and is widely supported by software for Windows, OS X, and Linux. It is an ideal format for use when creating CDs, as full sound quality is preserved. However, the large file sizes make it difficult to share via email or the web. 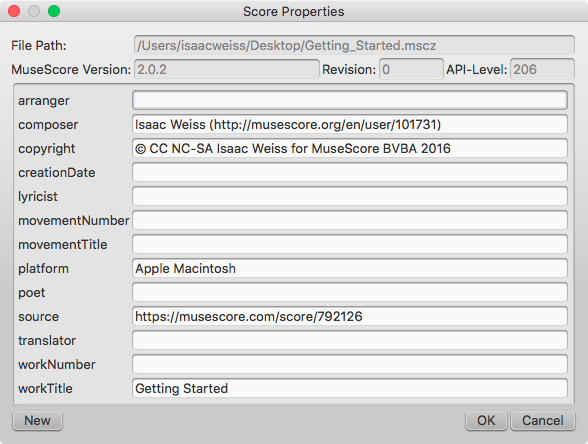 Ogg Vorbis is intended as a patent-free replacement for the popular MP3 audio format (which MuseScore also supports—see below). Like MP3, Ogg Vorbis files are relatively small (often a tenth of uncompressed audio), but some sound quality is lost. Windows and OS X do not have built-in support for Ogg Vorbis. However, software such as VLC media player and Firefox can play Ogg files on any operating system. MP3 files are relatively small (often a tenth of uncompressed audio), but some sound quality is lost. To be able to create MP3 files, an additional library, lame_enc.dll (Windows) or libmp3lame.dylib (Mac), needs to be installed. 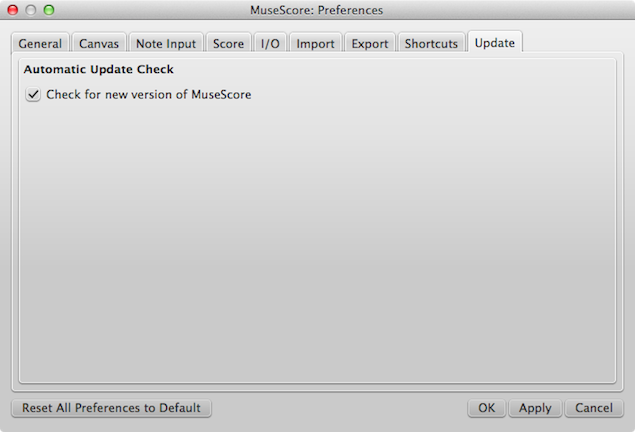 MuseScore will prompt you for its location. You can get it at http://lame.buanzo.org/. 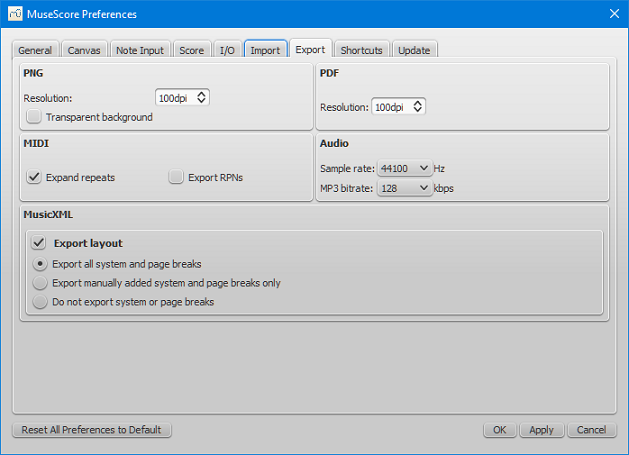 Set the MP3 bitrate in the Audio section. Set the Sample rate in the Audio section. 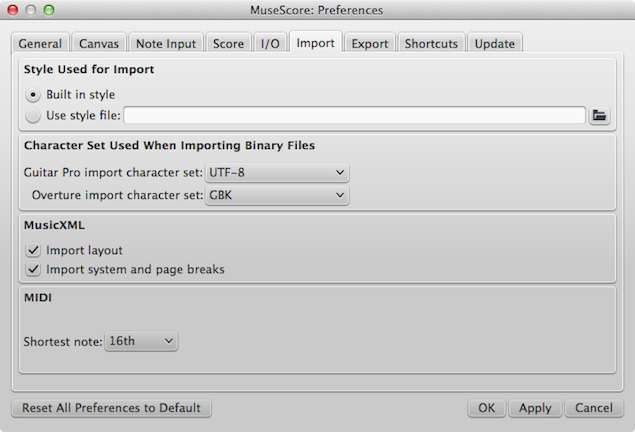 The following are musical score formats (like MuseScore's native format, MSCZ), which allow you to import files made with other music notation programs or export files that you can open with other music notation programs. 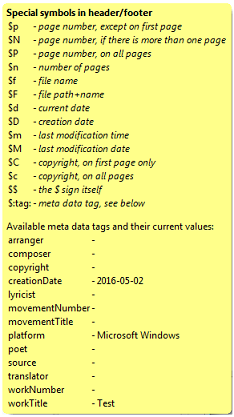 MusicXML is the universal standard for sheet music. 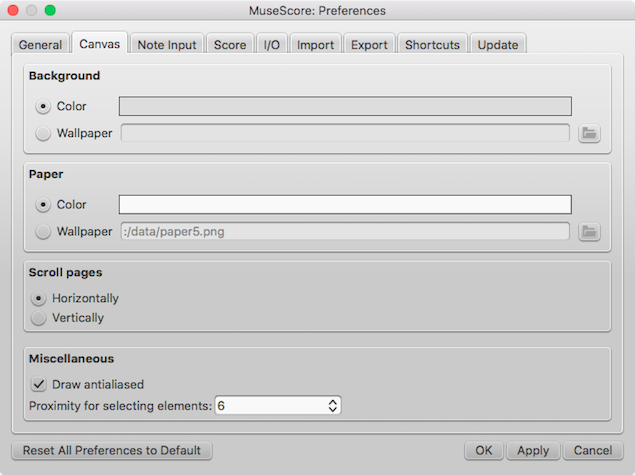 It is the recommended format for sharing sheet music between different scorewriters, including MuseScore, Sibelius, Finale, and more than 100 others. Musical Instrument Digital Interface (MIDI) (external link) is a format widely supported by sequencers and music notation software. 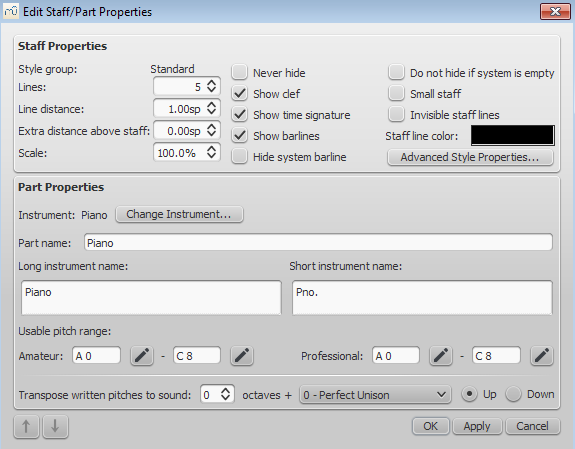 MIDI files are designed for playback purposes and do not contain score layout information about formatting, pitch spelling, voicing, ornaments, articulations, repeats, or key signatures, among other things. 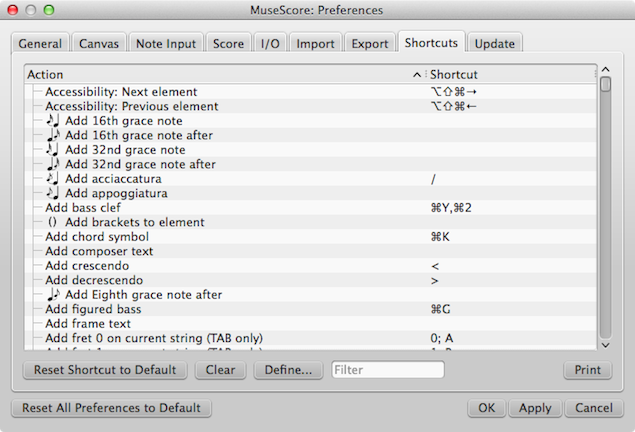 To share files between different music notation software, MusicXML is recommended instead. 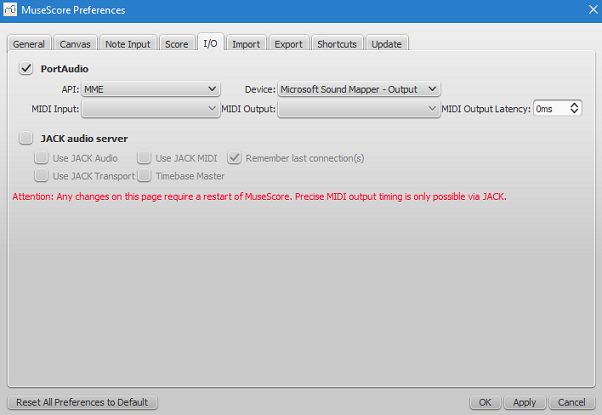 If you are only interested in playback, use MIDI. The distance between two staff lines, measured in spaces (abbr. : sp). If you set this to a higher value, the lines are spaced more widely apart; a lower value and they are closer together. 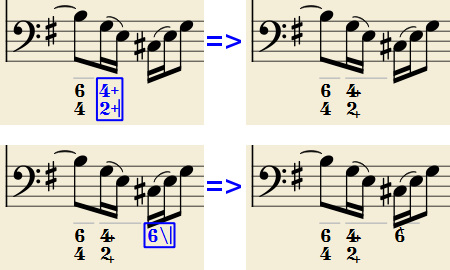 It is not recommended to change this value for the standard group, for which the default distance is 1.0 (instead, change the actual size of the sp unit in Sivun asetukset); other groups may have different default values (for instance, tablature usually has a line distance of 1.5 sp). Note: To alter the spacing above just one staff line in a particular system, see Vaihdot ja välistäjät. 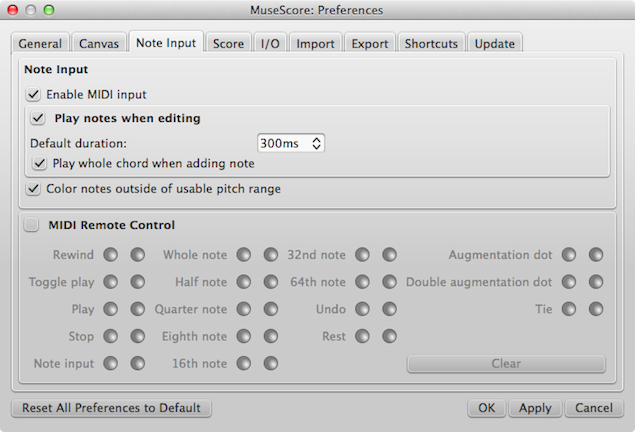 Notes outside this range will be marked in red in the score window, if "Color notes outside of usable pitch range" is ticked in Preferences > Note input.